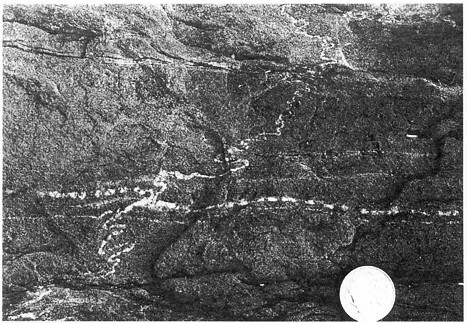 Folded & boudinaged granite dikes in tonalitic gneiss, Barberton granite-greenstone belt, South Africa. From Passchier, CW, Myers, JS, and Kroner, A., (1990). FIELD GEOLOGY OF HIGH GRADE GNEISS TERRANES. This is a sweet example of how you can get different structures developing in different orientations relative to the principal stress directions. 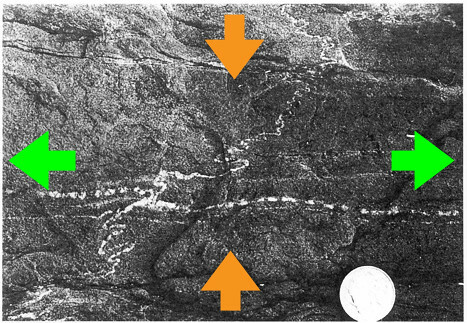 In this particular part of the Barberton Greenstone Belt, compression (orange arrows) operated from the top of the photo towards the bottom, and the rock stretched out from left to right (green arrows). Folds formed where granite dikes were compressed, but the same rock in a different orientation was boudinaged… Cool, eh? So that’s your Friday fold! The boudinage is just a little bonus for you, because, hey, it’s Friday.